The Berlin Conference (1884 – 1885) recognised the sovereignty of King Leopold II of Belgium over the Free State of the Congo. The king governed the territory until 1908, when it passed into the hands of the Belgian state. 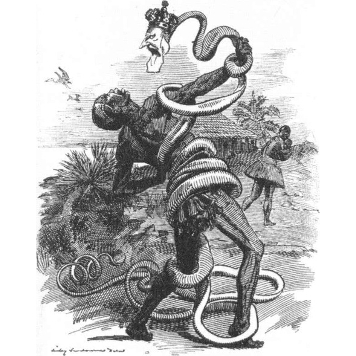 Caricature of Leopold II of Belgium in the form of a snake choking the Free State of the Congo, 1906. Leopold II ruled the Congo as his personal dominion from 1885 to 1908. During this period, the country was forced to endure the systematic exploitation of its natural resources, especially ivory and rubber. Though the territory was governed from Brussels, the administrative capital was the port city of Boma, from where the massive exports of raw materials were shipped. Boma was the residence of the Governor General of the Congo, who was the direct representative of the king (in fact, Leopold II never once set foot in Africa). The state was divided into 14 districts which were administrated by commissioners who reported to the Governor General, and were appointed directly by the king. These functionaries sometimes acted as colonial administrators and trading agents, though their main function was to secure the largest possible amounts of ivory and rubber in the shortest possible time. The colonial administration wielded control over the native population by imposing a regime of terror, and there were frequent mass killings and mutilations. Violence and terrorism were the means adopted to impose the will of the Belgian king and the trading agents over the African people. Leopold II was forced to hire European mercenaries to defend his interests. These were organised into a private army, the Force Publique, which numbered up to 19,000 troops. All the officers were white, while all the rank-and-file soldiers were black men who had been press-ganged into service and forced to serve in the Force Publique for a minimum of seven years. Recruits were sometimes bought from tribal leaders, though often they were simply kidnapped. Force Publique acted simultaneously as an army of occupation and as a police force which served the interests of the trading companies. The Force had to deal with several rebellions, which were put down with horrifying savagery. In practice, the Free State of the Congo was an enormous concentration camp. During the 1890s, and thanks to the widespread use of slaves, a more reliable transport network was built up, thus making it possible to export even more of the Congo’s natural resources. The construction of these infrastructures, all created exclusively for personal interests, resulted in the deaths of many workers of all ages. Their working days were long and hard, and required an enormous amount of physical effort. According to historical documentation, between five and 10 million people died as a result of the colonial exploitation under the rule and administration of King Leopold II and his functionaries. The first-person testimonies that have survived to the present day (and particularly those of Protestant missionaries, writers and diplomats sent to serve in the Congo) describe and denounce the horror of everyday life in the country. Important sources of information include the stories and data provided by the American missionary G.W. Williams and by the writers Mark Twain – “King Leopold’s Soliloquy” – and Joseph Conrad, as well as others such as the missionary Williams Sephard, the British diplomat Casement and the journalist Edmund Dene Morel. All of these men produced testimonies that were crucially important for unmasking the truth about one of the darkest episodes of the late 19th century. These critical voices who revealed the atrocities being inflicted on the Congolese people were published in the international press, leading to widespread public outcry and calls for the respect for human rights. In 1905, after several months of investigation, a commission published a report that corroborated the abuses that had been denounced. Leopold II could do nothing to prevent international public opinion – even in his home country of Belgium – from expressing its clear opposition to the continuation of his rule in the African country. Following a series of diplomatic manoeuvres, and driven by the pressure of public opinion, the Belgian king finally renounced his rule over the Free State of the Congo, which subsequently became a colony of Belgium, and was duly renamed the Belgian Congo.